BloodHorse.com has released an update to the BloodHorse.com video portal. 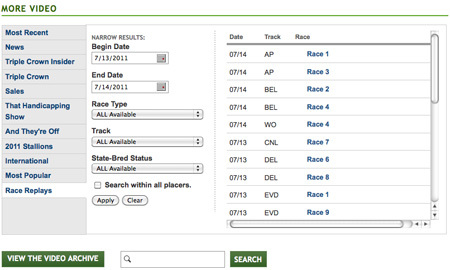 Upgrades include the ability to search for any Race Replay of your choice and a new tab organization structure. New tabs that have been added include International Video and News Video sections. 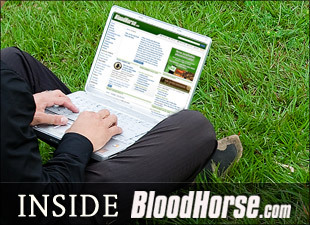 Other recent additions to the BloodHorse.com video portal include the ability to search all videos and view a video archive listing of all videos posted on BloodHorse.com; listed newest to oldest by posting date. You may manually enter a desired beginning and ending date or choose from the pop-up calendar. Note there is a replay search limit of 30 days. This means if you select over thirty days worth of races, you will be asked to narrow or refine your search. You may select a race type. Note that our results are limited to races worth $20,000 or more. You may select a track, track abbreviations are beside the track names. You may select a state-bred status. Once all desired information is set, simply click the “Apply” button and your results should display to the right of the “Narrow Results” options. If you would like to favorite/bookmark our race replays search tool, I would suggest using the following link. This link is a stand alone page for the race replays search tool. We have heard your voices and returned with international video content. Features of our favorite international horses, farms, industry members and of course event coverage from races and meets from around the globe. Events already covered include the Irish Derby and Royal Ascot. With more special features airing monthly.